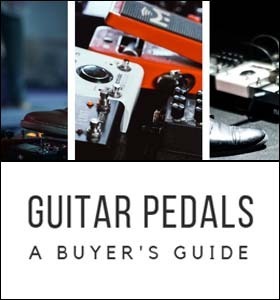 Why should you buy a guitar pedal? We looked at 14 of the most essential guitar pedals to have on your pedalboard and came up with the following: Overdrive, Distortion, Fuzz, Wah, Chorus, Delay, and Reverb. And after looking at the data and our research, we chose the best performing pedals as our top picks. Read on for the details! Whether you’re an experienced rock god or a new player just putting together your first guitar and amp setup, you’ll always get the feeling that there’s something more you could be adding. If you’re like most, as you get comfortable with your instrument you’ll quickly become more and more dissatisfied with the limited on-board guitar controls and effects (especially when you watch your idols on stage with their high-end set-ups) and you'll probably be looking for the next step to take your sound to the next level. 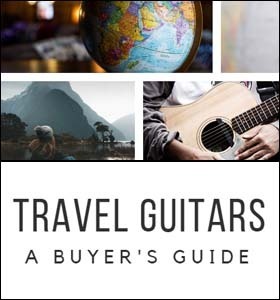 That next step is a guitar pedal, and this will be your complete guide to choosing the perfect option to suit your needs. High end pedal. Maintains the integrity of your sound. Affordable overdrive. Great entry-level option, carries a lot of power. Sturdy as a brick. Impeccable build quality makes this pedal very reliable. For more experienced players. Allows you to fine-tune bass, mid, and treble. Entry-level fuzz pedal with full capabilities. Subtle "dirty-ness" or heavy distortion, take your pick. 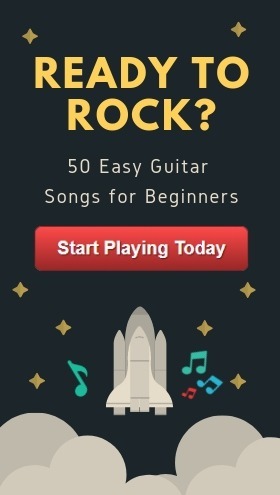 Lets you play like Jimi Hendrix. Higher-end fuzz pedal with great value. Simplicity in a pedal at its finest. No frills, shills, or annoying features. 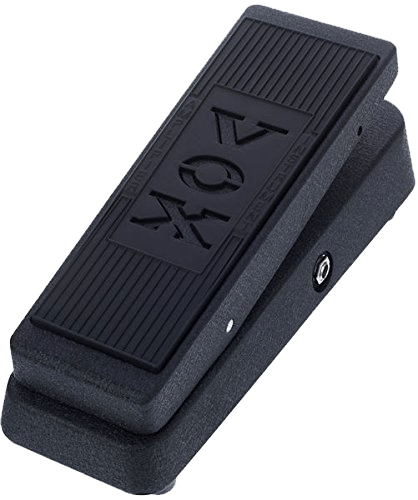 Premium wah pedal. 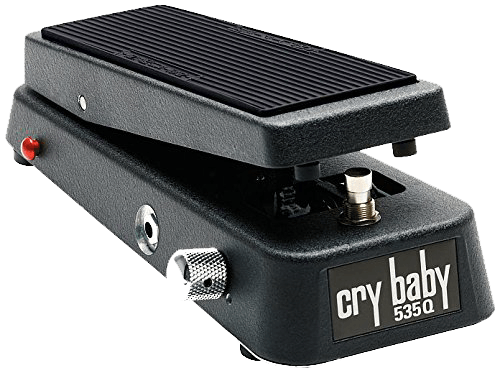 Great depth of sound, one of the best wah pedals around. An incredible chorus pedal, great signal output quality. One of the most popular chorus pedals. Great build quality, awesome sound. A high-performance delay pedal at an affordable price. Great sound quality. Outputs a "thick", deep sound with some subtle reverb. For tinkerers. Lets you set decay, tone, volume, and various presets. Entry-level reverb pedal. Less customization, but includes all of the essentials. Need some songs to go along with your pedal? Enter your email below and I'll send you a list of 50 easy guitar songs you can play right now and practice your effects on. The first thing you need to know is that buying a pedal is never mandatory. If you’re not sure you need one, you probably don’t. Unlike stands, tuners, strings, and straps which all fill general roles in ensuring the playability of your instrument, pedals are instead focused around specific niches for certain genres. We covered all the essentials aside from looper pedals. That means that you can’t just buy a “jack-of-all-trades” pedal and be happy with the performance, and instead need to buy specific models designed for different styles of music and effects. Unless there’s a sound in mind that you’re specifically looking to replicate, you might want to skip this step in the buying process until you do. For everyone else though, I’ll go through a quick overview of the most popular types of pedals, how they work, and specific models you should be looking to add to your collection. Much like the knob on your amplifier or guitar, the primary purpose of the overdrive pedal is to increase the volume of your input (or more generally, applying gain to the notes that you’re playing) to create higher volumes. Since amplifiers can’t necessarily fully process the added input, the highs and lows are clipped closer to mid-range frequencies, creating that thicker, more powerful sound while still maintaining the clarity of the notes that you’re playing. These are extremely popular in rock music due to the added punch that they provide, and are a great starting point into the world of pedals. 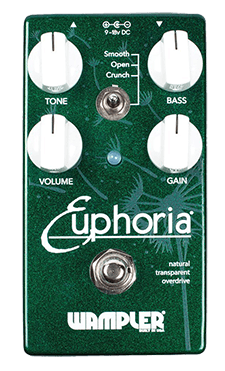 Featuring tone, volume, bass, and that critical gain control knob, the Euphoria pedal features input and output jacks that plug into your guitar on one end, and into an amp at the other. It’s high-end digital circuitry amplifies the power of the guitar while maintaining the integrity of your sound, resulting in high highs, and low lows, with nothing lost or added in the process. This is just a great example of an overdrive pedal done right, as the sound that passes through it will please the ears of even the most discerning audiophile. ​Check out the Wampler Euphoria V2 on Amazon. 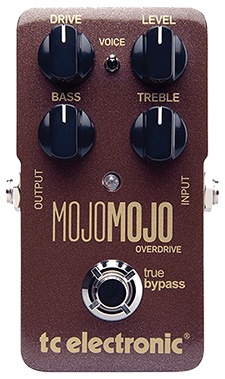 If you’re a little more budget focused after splurging on that new guitar but still want great sound passing through your pedal, the MojoMojo is a great entry level option that carries a ton of power. But a word of warning: You might not want to push it to its absolute limits unless you want to wander into distortion territory, as you’ll start to see some unwanted noise in your output. This can be a deal-breaker for some, but if you just want to dabble with the effect, this pedal can handle it in short bursts. It also features an extremely handy bass-response toggle, which ensures that those notes are never lost in the mix when using the pedal. It can result in a heavier sound, but it adds some nice presence to your music that can be quite welcome depending on the genre you’re playing. Check out the TC Electronic MojoMojo on Amazon. More commonly found in the world of heavy rock and metal music, distortion pedals are distinct from overdrive by completely altering the shape of the sound wave emitted itself. The buying process for these pedals can be tricky since each model works to push slightly different sounds through to your amplifier, but ultimately all share the same overall design philosophy. All the sound waves produced through these pedals are equalized (to varying degrees) to middle range frequencies which allows listeners to hear all the crunching lows and wailing highs screaming from your guitar. This sturdy stomp box might not look out place on a construction site, but that’s because its build quality will reliably get you years of consistent use. 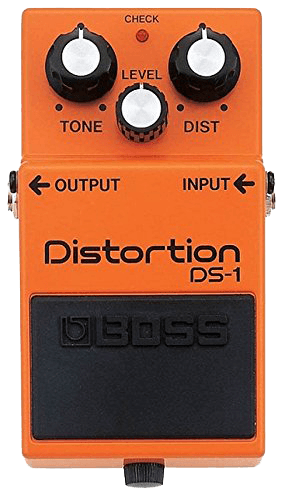 The DS-1 is an extremely versatile distortion pedal that can give you all the crunch and dirt you’re looking for at an affordable price, but does tend to give preference to higher pitched tones on output. It’s onboard controls probably shouldn’t get cranked up the maximum unless you enjoy sharp, piercing high notes, but the range these controls have is still quite impressive. If you’re looking for the skull-crushing rhythms found in genres like death metal you’ll want to look elsewhere, but if not, the Boss will serve you just fine, like it has everyone else for forty years. ​Check out the Boss DS-1 on Amazon. 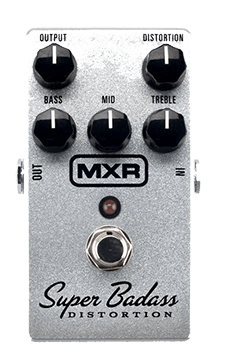 The MXR is a fantastic option for more experienced players looking for a pedal that they can micro-manage to fine-tune their performance. This pedal is fully featured (and more expensive) than the DS-1 we looked at earlier because it offers bass, mid, and treble controls. While it’s endlessly adjustable, cranking the distortion knob all the way to the max cuts out the complexity and results in the simple and aggressive sound you’re probably looking for at almost every EQ setting. Whether you want to explore the high or low end of the frequency spectrum, you’ll be getting true to life performance that doesn’t compromise on sound quality, for a price that’s extremely hard to beat. ​Check out the MXR M75 Super Badass Distortion Pedal on Amazon. Even more extreme and aggressive, fuzz pedals are actually a unique subset of distortion pedals and work in a similar way. 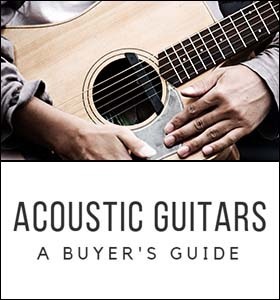 They still alter the original sound of your guitar, but do so by squaring off and sustaining the note that you’re playing, resulting in that trademark “buzzing” sound. While the degree to which this effect is achieved varies according to your needs, in general this creates a dirty, muddled sound that loses a lot of the nuance and integrity of the original notes that you’re playing, but can still be a desirable effect in something like industrial music. Fuzz effects aren't too complex electronically, and Donner sticks to this mantra of "simplicity" by providing an entry-level option that does everything you could reasonably expect from a fuzz pedal. At lower settings you can get that subtle dirty-ness that will remind your listeners of the country classics, but it still delivers that heavy distortion you crave on the high end, without introducing unwanted signal noise. Some players can find that the sound produced at lower sustain settings isn’t quite as clean as they would expect, but if you’re someone who likes to get down and dirty with their effects, then that shouldn’t bother you too much -- except in rare instances where you might want to tone it down. ​Check out the Donner Stylish Fuzz Pedal on Amazon. 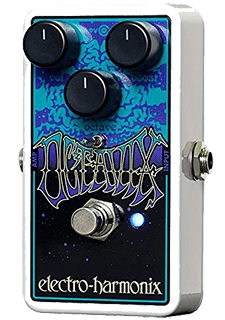 If you’re into fuzz effects because you want to play like Jimi, then look no further than the Octavix. Nothing will get you closer to the rock god himself than the fuzz this pedal can provide. On top of the volume and fuzz (boost on this model) control that you’re looking for, the Octavix offers some versatility by including an Octave knob, which allows you to simulate the deeper sounds of a bass guitar, or even go up an octave if you wish! It’s not mandatory, and the effect can be completely turned off by dialing the knob all the way to zero, which results in a traditional, albeit expensive fuzz option. 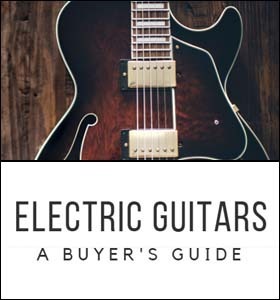 Still, if you have the cash and want something a little higher end that adds value by including features without compromising on its stunning sound quality, then Electro-Harmonix is where you want to turn. ​Check out the Electro-Harmonix Octavix Fuzz Pedal on Amazon. Have you ever altered the tone knob on your guitar, but couldn’t make a clear distinction between the sounds produced? Well, as its name implies, tone controls alter the bass or treble of your guitar which results in either deep sounds at the low end, or high, “tinny” sounds at the higher end. While this can be great for achieving desired effects for different songs and genres, it’s not as effective as a wah pedal, which changes these tones on the fly as your foot presses down on it. This forces the output sound to go through the entire range of tones on demand and give your playing a surprising amount of emotion and nuance. There’s something to be said for simplicity, and that’s exactly what you get when you buy the V845. There are no frills, added controls, or annoying features. Featuring a simple “on-off” switch at the press of a button, the Vox delivers a lot of performance that will capture the sound of 60s and 70s blues and classic rock each time you use it. It’s extremely simple to set-up thanks to the option of using both an AC adapter or a battery for power. Its an ideal pedal for occasional use, or if you're carrying it around with you on the go. Don’t get me wrong, purists will still love the quality that comes out of this little thing, but since it lacks some of the adjustable features of its competitors, dedicated users might find it slightly lacking when trying to optimize their sound. ​Check out the Vox V845 Wah Wah Pedal on Amazon. This is a premium pedal from Dunlop with excellent control and performance. It not only achieves that depth of sound you’re looking for, but this pedal also features on-board controls to adjust boost and frequency center. This gives you maximum control. If you’re not sure about what settings you need to get your desired effect, it has built-in pre-sets to let you play along to some of the greats with no effort required on your part. Its durable construction might have you struggling to press down on it at first, but give it some grease and time and you’ll be surprised at how smooth the action becomes. The bottom line is that the Dunlop is probably one of the best wah pedals money can buy, and that’s not an exaggeration considering it has been played across the world by some of the best musicians to ever pick up the instrument. ​Check out the Dunlop 535Q Cry Baby on Amazon. If you’ve ever been tired of sounding like a one-man band when you’re jamming in your garage or basement, then a chorus pedal is what you’re after. These work by creating doubles of the notes that you’re playing, but in a slightly delayed and altered fashion. This results in an effect that simulates multiple other guitarists backing you up, and can create some real depth to the rhythms or solos that you’re playing. These pedals will always have controls to adjust the time that these doubled notes are played at, but can also have other handy controls like equalization knobs to give more versatility with a single pedal. The name might put you off, but give it a chance and you’ll be glad you did because Deadbeat Sound has managed to put together one of the best chorus pedals on the market. It gives you the ability to control the depth, speed, and level of the chorus effect, and while at mid levels it might not sound as saturated as you might have hoped for, crank up the dials just a little bit more and you’ll be blown away by its performance. The notes it carries are a clean, accurate representation of what you’re playing in real-time, and introduces no discernible signal interference even when it’s not in use. This means that you can keep it plugged in and only adjust the dials when you need them on a song by song basis, without compromising the quality of the audio you’re putting out. If you play with the settings a bit you can create some surreal, almost distorted sounds that can really play with your audience and give them a fantastic listening experience they won’t quickly forget. ​Check out the Deadbeat Sound Wet Dreams on Amazon. 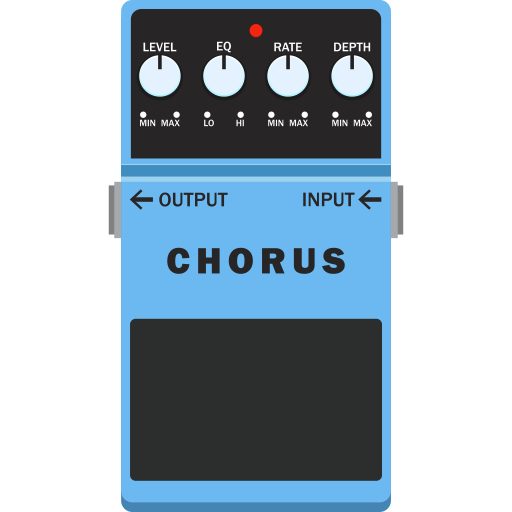 The widely loved CH-1 is one of the most popular chorus pedals for a reason. It has a great build quality that looks and feels great in the hand, but more importantly also produces one of the best sounds from a chorus pedal to date thanks to the great texture of the output, which serves to give your music a nice weight. The knobs have great travel to them which gives you a lot of room to make subtle, but noticeable adjustments that work just as well at the low and high frequency levels, and at full blast the performance it puts out will rock the room even if you’re playing solo, and will leave you more than happy with the results. 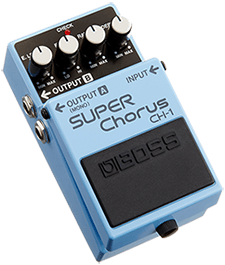 ​Check out the Boss CH-1 Super Chorus on Amazon. A more appropriate name would perhaps be an echo pedal, because these boxes work by recording and playing back notes that you’re playing to simulate the echoes that occur as sound bounces off the walls of a venue. Essentially, the signal (or information) that you’re playing gets stored temporarily in a buffer, which can then be manipulated in a variety of ways. In this case, the information is often distorted and then repeated a set number of times to achieve the desired effect. 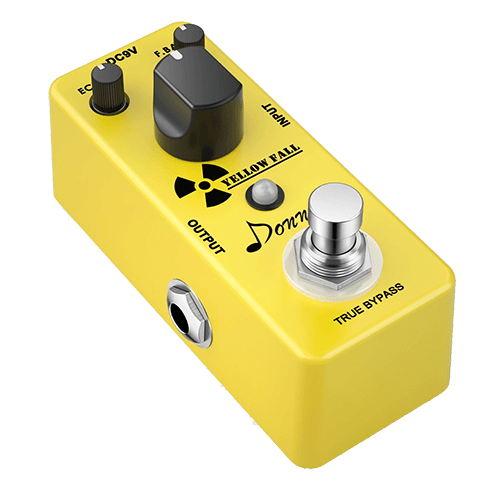 However, unlike a reverb pedal (which we’ll look at next), delay pedals almost always repeat the exact same note that you’re already playing. The second Donner option on our list once again hits it out of the park with a high-performance pedal that can work as a standalone tool on stage with you, or even in conjunction with something like an overdrive pedal. This is possible thanks to the lack of boosts to the delay signals being produced. The actual output audio is unaltered, which means that it will play nicely with other effects without interfering with those individual signal processors. While some players might find the delay hard to set to their preferences, this isn’t a design flaw, but is instead actually due to the three individual knobs for the echo, feedback, and time that must be individually adjusted to get something that sounds good. It’s a tricky system to master, but nothing that’s good comes easy, right? Stick with it and you’ll have an affordable, reliable tool that can create an endless variety of delay effects. ​Check out the Donner Yellow Fall on Amazon. 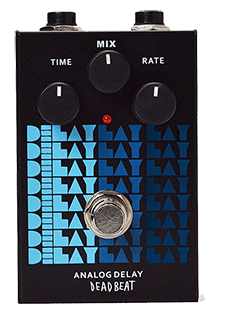 Another great option for ballers on a budget, the Delay-lay-lay by Deadbeat Sound features similar control options to the Donner, but arguably surpasses it (though slightly) in audio quality. The sound produced by this pedal is very thick, and can even offer some subtle reverb effects in the way that it decays the note slightly over time. Again, you won’t be getting a two in one steal, but it’s some nice added value if you’re looking to maximize what you’re getting in return for your dollars. One downside with this model is the build quality. It’s not bad by any means, but it doesn’t have the sturdy feel of the Donner which might make you think twice before throwing it in your bag and taking it on stage. In a controlled environment like your home studio or bedroom though, it’s an excellent tool to the enrich your playing. ​Check out the Deadbeat Sound Delay-lay-lay on Amazon. If you’re a newer guitar player who has been looking things up online, chances are you’re confused by the difference between reverb and delay effects, and I don’t blame you! In fact, reverb also relies on the same echoes produced by sound to function, so the distinction can be quite narrow. Originally, reverb was achieved by creating a sound, and then recording the ensuing bounces among the surfaces of the room. The sound would eventually decay and no longer be audible, and it’s that slow decaying and altering of sound that these reverb pedals attempt to reproduce. If you’re looking at simulating the experience of playing in tight, enclosed spaces, then these pedals are definitely an attractive option. If you’re a tinkerer who loves to play with the settings of your gear, then the Hall of Fame is your match made in heaven thanks to the customization it offers through its controls. It not only sports knobs for the decay, tone, and level of your audio, but also has ten pre-sets to simulate the sounds of playing in different spaces, as well as a toggle to set the length of time before the delay occurs after playing. It’s a lot to consider, and comes with a hefty price tag, but considering you can also output in both stereo or mono, you have a ton of flexibility in a small form factor when you go with this option. Even if you don’t want to deal with the headache of setting it up though, even the simplest delayed effects results in natural sound at all frequency ranges, making it ideal for people who love to dabble in different genres of music, or even for those who want to use more than one pedal effect. It can even be altered on the fly by adapting to the pressure you put on the footswitch, which amplifies or subdues the effect, and that’s a great feature for players who want to downsize their set-ups. 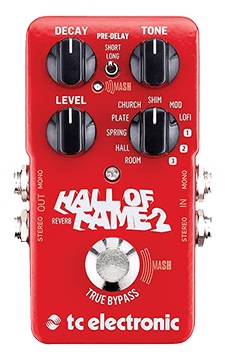 ​Check out the TC Electronic HoF 2 on Amazon. It compromises on performance by offering less adjustability, less features, and less sound output options, but it still provides what you want a reverb pedal to accomplish at its core. This is a basic, entry level pedal that is ideally targeted for players just dabbling in the effect, but can still produce some more complex interactions by toying with the settings. The note decays it produces is still crisp and clear, but starts to fall off after extended use by producing the occasional strange noises. Faults aside, the Donner will still be of great use to you if you’re just getting immersed in the world of pedals, or want something that can take your home playing for the next level. If you’re recording in studio or need a handy little pedal to take to your next live venues though, you might want to spring for a more fully-featured model, as this one can sometimes feel limited in what it offers. 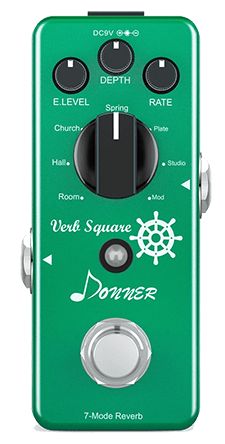 ​Check out the Donner Digital Reverb Pedal on Amazon. The world of guitar pedals is varied and vast, and I’ve barely scratched the surface! There are plenty more niche effects that can be achieved with other types of pedals, but the ones I’ve outlined here are the absolute essentials that you should have in your collection if you’re thinking about stepping up your game. You can’t go wrong with any of the models I’ve listed here, so if you're up for it, take the dive and buy yourself some new toys.